The weather has been YUK… Everyone here has been sick. Even the dog is sick of winter and she LOVES the snow. I’ve tried brighter light bulbs, looking at beach pic’s (which just make me miss the beach) and denial. But-nothing is working. Like it or not- it’s here-(and it’s grey) the Winter doldrums. DUM DUM DUM. We call him Spidey hat finished! Stick a fork in Spidey- He’s done! I always think I can’t do new things… until I try. 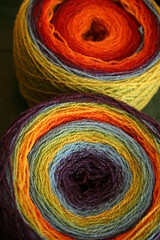 For as long as I’ve been knitting- I’ve avoided colorwork. As in- run from it like it’s on fire… avoidance. 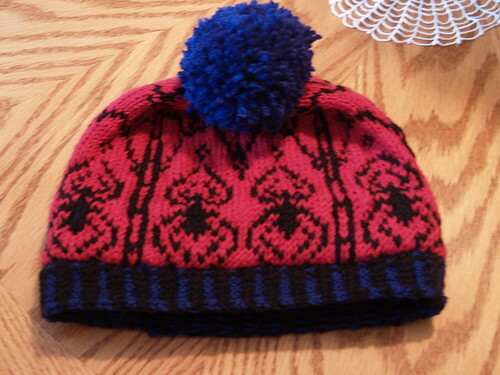 Then, I found this hat pattern. Too perfect for my little guys Christmas . I had to at least TRY. 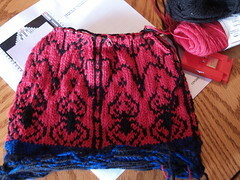 Now- I’ve less than 10 rows to finish the colorwork. And- I’m still in shock. I can do this! It’s no where near as hard as I’d thought it would be. Sure- it’s slower than straight knitting , but no more so than lace.